In memory of my Grandfather Daniel Falvey (man in cap with walking stick below right), who served his country in the Great War 1914-1918, was shot and wounded in the leg, was rescued by German troops, was treated for his injuries by them and was then re-patriated at the end of the war to marry my Granny Gladys Jones and father 11 children & 32 grandchildren. A proud and dignified man of the RC Church, Daniel steadfastly refused to let his (not insignificant) leg injury prevent him or be an axcuse for not working hard for a living and supporting his family, and he worked for Swansea Corporation in mainly manual type jobs until his retirement. Daniel's son Gerard (one of 5 five sons and six daughters) was probably signing up for his national service in this photo, and himself served in Burma in the late 1940's early 1950's - raising 5 children and 10 grandchildren. And in thanks to my paternal Grandfather William Howells b. 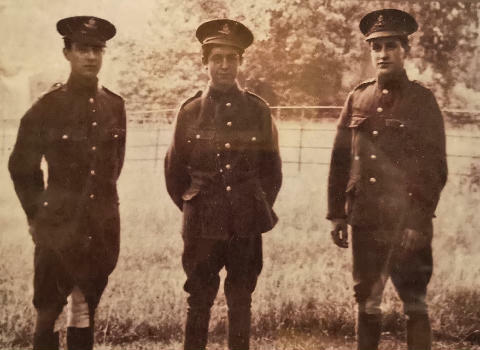 1892 (below left and on the left), and his two brothers, Lawrence (centre) and Stanley Howells (right) pictured below and their kid brother Sam Howells (sent home aged 15) - all from Port Talbot - who served in the Royal Horse Artillery throughout the Great War and came home safely. Grampa William later worked at Velindre Wagon Works in Port Talbot and had eight grand children. His brother in law Great Uncle William Croke, from Port Talbot/Resolven who served and died (aged 19) as a stretcher bearer at the Great Passchendaele offensive in the Great War. In memory of all who served and those who served and suffered great sacrifice at home. on a friendly village green. Two bedrooms, 3 beds. Dog friendly & Secure. Walk to the pub (with food), village shop. Fridge, Freezer, Central Heating, Log Burner, off-road parking. Walk from the door to stunning beach/woods/dunes/cliffs. Cheriton Valley, and several nearby Nature Reserves and SSSIs. Walk tpo the top of Llanmadoc Hill - fantastic views to The Worm, The Brecon Beacons, Carmarthen Bay and Tenby. Walk to Rhossili village over Rhossili Down. Explore Burry Holm, Spaniard Rocks, the Five Chimneys, Cheriton Valley to Llanrhidian. We take a 30% deposit. Payment via BACS, Paypal or cheques. Balance within two calendar months of arrival. plus superfast BT Broadband WIFI and SKY/BT Sports-packages. Our gardens are 100% dog proof. and they average £1450 per week in August. Nov, Dec, Jan, and February. We ask guests to kindly plan to arrive after 3.00pm on arrivals day. 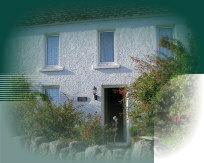 We ask guests if they could kindly co-operate by departing by 11.00am on your departure day. Pay online via a simple BACS transfer - using “Online Home Banking’ (we will provide Bank Acc/sort on booking).